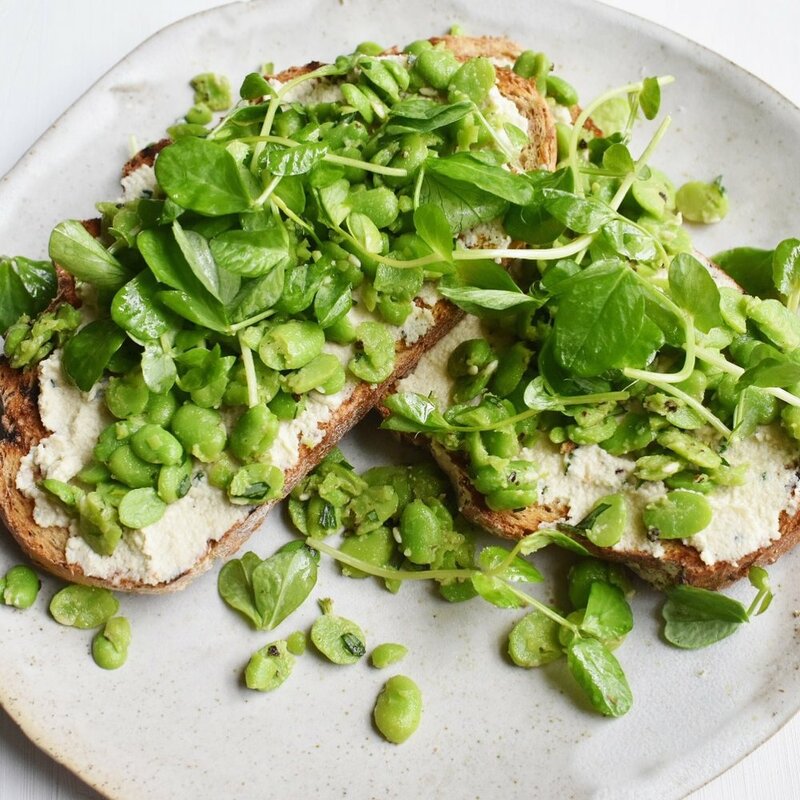 This is one of my favourite meals to make at the moment as it's got everything you want in a summer meal - the crunch and chew of the char-grilled bread, the garlicky, creamy cashew cheese, and the fresh, herby dressed broad beans all go together so incredibly well. This bruschetta recipe makes the perfect weekend lunch to have at home or alfresco, or you can make everything in advance for an impressive (but easy) vegan dinner party starter. 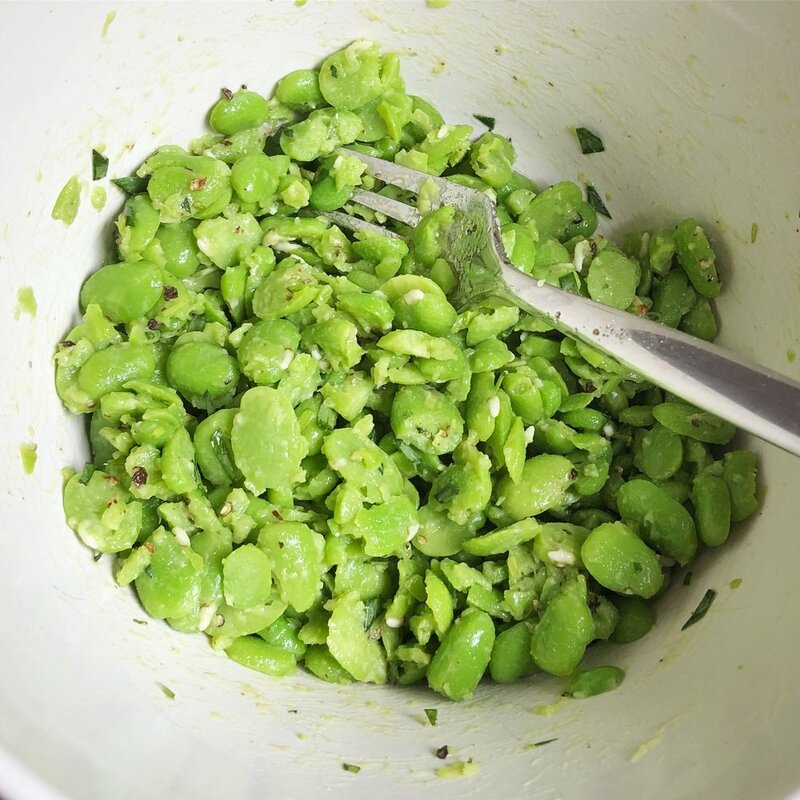 Tip the broad beans into a pan of boiling water and simmer for two minutes. Drain the beans in a sieve and run under a cold tap until cool. Now the fun part - pop the beans out of their skins into a bowl. Just give them a gentle squeeze and the skins will break open and the bright green bean pops out. This bit is quite therapeutic - put some music on and enjoy the process! Add the chopped tarragon leaves to the beans, then use the back of a fork to mash some of the beans, leaving about half of the beans whole. Add the olive oil and stir together. Now, heat a griddle pan until it's red hot. Place the slices of bread on the griddle pan for around one minute on each side, or until they're gently char-grilled. You might have to do this in two batches if there's not room for four slices in the pan. Halve the garlic clove (no need to peel the skin off) then rub the cut side into the griddled bread. Spread each slice with two tablespoons of the vegan cashew cream cheese, then top with the bean mixture. Garnish each with the pea shoots or rocket to add extra height and flavour to the bruschetta, then serve!